Early last year, the Federal Motor Carrier Safety Administration issued federal motor carrier number 999999. During the remainder of 2017 and for the first months of this year, the agency will be issuing new motor carrier applicants with 6-digit MC numbers that were either never issued or were unused. Later this year, however, new 7-digit MC number will start to issue. FMCSA cautions that some systems may need to be changed in order to accommodate the new longer MC numbers, and has asked us to spread the word. We add that the change to MC numbers DOES NOT affect either already existing MC numbers or any DOT numbers. For more information, contact Ken Riddle at FMCSA, kenneth.riddle@dot.gov. PA Turnpike advises that fuel will not be available at the Sideling Hill Service Plaza during the week of Feb. 26. The PA Turnpike Commission (PTC) advises that gas and diesel fuel will not be available at the Sideling Hill Service Plaza in Fulton County, eastbound and westbound, from 8 a.m. Monday, Feb. 26 through 5 p.m. Friday, March 2. Motorists should not stop for fuel at Sideling Hill during this period but should travel onto the next service plazas. All other services will be available. The plaza’s fuel pumps will be operational for the weekend of March 3. ***Between February 5th and 6th the National Registry system sent email notifications to certain Medical Examiners that they would be removed from the National Registry because system records indicated their credentials are expired or due to expire shortly. The notification was an error. FMCSA is not currently planning to remove any Medical Examiners from its National Registry based on out-of-date information. Although the National Registry is currently under construction, certified medical examiners can continue conducting physical qualification examinations of CMV drivers and issuing paper Medical Examiner's Certificate (MEC), Form MCSA-5876 to qualified drivers. Medical examiners should segregate all examinations completed during the outage and be prepared to upload them to the National Registry system when it is back online, with no penalties. As a part of its 2017 budget package, Pennsylvania enacted a new requirement that those making payments to nonresident independent contractors must withhold a part of the payment to cover potential liability of the contractors for Pennsylvania state income tax. HOWEVER, this requirement does NOT apply to payments by motor carriers to owner-operators. Federal law, 49 US Code 14503, says a state can’t require a carrier to withhold income tax on an interstate employee - or require such an employee to pay an income tax - except the state of the employee’s residence. And the statute’s definition of “employee” includes independent contractors. The Pennsylvania Motor Truck Association says the state’s revenue department is aware of the federal restriction and will not be enforcing the requirement on motor carriers with respect to owner-operators that don’t live in Pennsylvania. The federal tax reform package that passed Congress December 20 changes the rules for some truck drivers on the expenses they incur for meals and incidentals while they’re away from home on travel. Employee truck drivers whose carrier does not pay them a per diem allowance will no longer be able to take the costs of meals and incidentals as an itemized deduction, as they have in the past. Although this will be hard on some drivers, it may not make a difference to many, since the new tax law also doubles the standard deduction for taxpayers, so that fewer drivers will be itemizing at all. This change is effective now, for 2018 taxes. Note that owner-operators will still be able to deduct their costs for meals and incidentals, just as they have in the past, since owner-operators are in business for themselves, and those costs are deductible business expenses. Finally, some carriers pay their employee drivers a separate per diem allowance to cover meals and incidentals. The rules for carriers and drivers in that situation do not change. We might caution, however, that the rules pertaining to per diem programs are complicated and somewhat tricky to implement. The New Jersey Motor Vehicle Commission (MVC) recently announced the launch of two state-of-the-art mobile agency vehicles that will increase customer convenience by bringing essential MVC services directly to motorists all around the state. The mobile units can be used to help augment customer processing at existing brick and mortar agencies during peak transaction periods. They are currently being used in Middlesex County at the Edison Agency and also in Union County at the Rahway Agency to help offset increased demand due to the closure of the South Plainfield Agency (the MVC expects to open a new and expanded agency in South Plainfield in 2018). In the future, the mobile units also can be deployed statewide to meet the needs of underserved communities, senior centers and any location impacted by natural disasters where the immediate replacement of identification documents might be needed. Additionally, these mobile units can also be used, on a scheduled basis, to process transactions at universities, office campuses, government centers and shopping areas or any location where a substantial amount of transactions can be anticipated. The new units are truck-style vehicles that contain most of the features present in a traditional MVC agency. Customers can use them to renew or obtain duplicate driver licenses, obtain a non-driver ID, renew their vehicle registration, or even obtain a Person with a Disability, Purple Heart, or Disabled Veteran parking placard. For more information about the MVC mobile agency units, contact us at mvc.mobileagency@mvc.nj.gov or (609) 633-9456. Jacobs Vehicle Systems®, the world’s leading manufacturer of diesel and natural gas engine retarding systems and valve actuation mechanisms, has been honored by Cummins Inc. with the Category Partnership Award. For over five decades, Jacobs has partnered with Cummins Inc. to deliver industry-leading valvetrain technologies for on- and off-highway vehicles. Domestically, Jacobs designs and manufactures engine brakes for Cummins Inc. for the ISL, ISX-12, and ISM engines as well as the ISX-15/X15 platform which offers the highest performance of any engine brake in North America. Across the globe, Jacobs Engine Brakes® are installed in the Cummins ISZ, ISM, and ISL engines in China and the ISL engine in India, Brazil, and Europe. In addition, aftermarket up-fit kits continue to be produced for legacy engine platforms. Brooklyn Center, Minnesota – With America’s biggest game of the year headed to U.S. Bank Stadium in Minneapolis, Minnesota this weekend, millions of Americans are already planning their gameday parties. While planning the menu, have you thought about how all those classic football foods get to your table? The answer is simple: trucks. 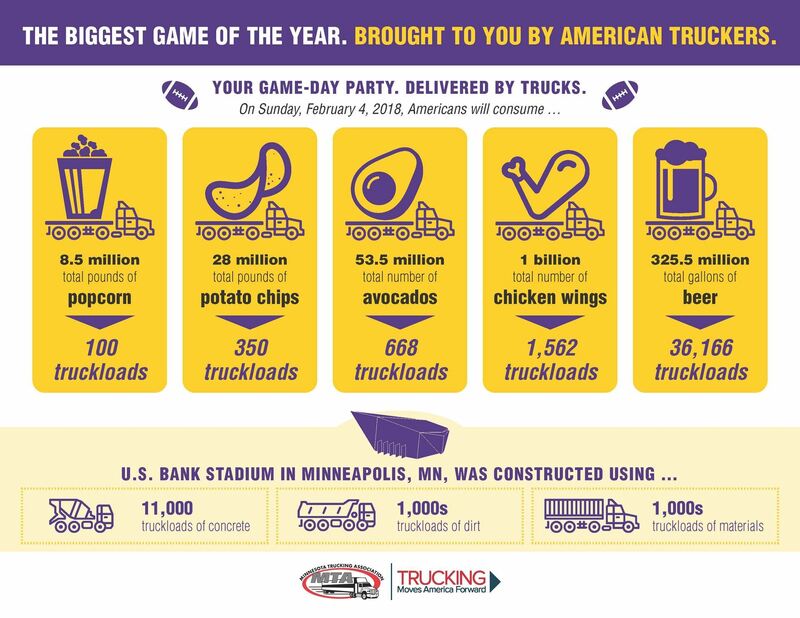 To illustrate just how big of an impact the trucking industry has on the big game, the Minnesota Trucking Association and American Trucking Associations created an infographic to show the role trucking will play in delivering perhaps one of most important parts of the game… the snacks. On February 4, Americans will consume over 100 truckloads of popcorn, 350 truckloads of potato chips, 668 truckloads of avocados, 1,562 truckloads of chicken wings, and over 36,166 truckloads of beer. That’s a lot of food! While the food and drinks are arguably one of the best parts of the big game, trucking also plays a vital role in delivering products that impact every part of the big game. In addition to the thousands of truckloads of construction materials it took to build U.S. Bank Stadium, trucks will deliver everything from sports equipment, production equipment, paper products, fuel to get everyone to the game, and much more! Not to mention all the truckloads of materials for the events and experiences leading up to the big game across the Twin Cities. So, when you sit down to watch football on February 4, take a minute to think about all the trucks it took to deliver America’s biggest game. If you’ve got it, a truck brought it! The Regional Field Administrators for the Federal Motor Carrier Safety Administration's (FMCSA) Eastern Service Center, Southern Service Center, Midwestern Service Center and Western Service Center hereby declare that an emergency exists that warrants extension of the Regional Declaration of Emergency issued on December 30, 2017, and continuing the exemption granted in accordance with 49 CFR § 390.23(a)(l) from Parts 390 through 399 of the Federal Motor Carrier Safety Regulations (FMCSRs), except as otherwise restricted herein. Alabama, Arkansas, Connecticut, Delaware, Florida, Georgia, Illinois, Indiana, Iowa, Kansas, Kentucky, Louisiana, Maryland, Massachusetts, Maine, Michigan, Minnesota, Mississippi, Missouri, Nebraska, New Hampshire, New Jersey, New York. North Carolina, North Dakota, Ohio, Oklahoma, Pennsylvania, Rhode Island, South Carolina, South Dakota, Tennessee, Texas, Vermont, Virginia, Washington, D.C., West Virginia and Wisconsin. On December 30, 2017, as a result of the effects of severe winter weather, including Winter Storms Frankie and Grayson, FMCSA issued a Regional Declaration of Emergency for the Affected States and jurisdictions. The Emergency Declaration was extended on January 10, 2018. Because emergency conditions have not abated, FMCSA is again extending the Emergency Declaration and associated regulatory relief in accordance with 49 CFR § 390.25. This extension of the Regional Declaration of Emergency addresses ongoing emergency conditions creating a need for immediate transportation of heating fuel, including propane, natural gas, and heating oil, into and from the Affected States and jurisdictions and provides necessary relief. By execution of this extension of the Emergency Declaration, motor carriers and drivers providing direct assistance supporting emergency relief efforts transporting heating fuel, including propane, natural gas and heating oil, into and from the Affected States and jurisdictions are granted emergency relief from Parts 390 through 399 of Title 49 Code of Federal Regulations except as restricted herein. Nothing contained in this extension of the Emergency Declaration shall be construed as an exemption from the controlled substances and alcohol use and testing requirements (49 CFR Part 382), the commercial driver's license requirements (49 CFR Part 383), the financial responsibility (insurance) requirements (49 CFR Part 387), hazardous materials regulations (49 CFR Parts 100 through 180), applicable size and weight requirements, or any other portion of the regulations not specifically authorized pursuant to 49 CFR § 390.23. 1. 49 CFR § 392.2 related to the operation of a commercial motor vehicle in accordance with State laws and regulations, including compliance with applicable speed limits and other traffic restrictions. 2. 49 CFR § 392.3 related to operation of a commercial motor vehicle while a driver's ability or alertness is so impaired, or so likely to become impaired, through fatigue, illness; or any other cause, as to make it unsafe for him/her to begin or continue to operate the commercial motor vehicle. Upon termination of direct assistance to the emergency relief effort, no motor carrier shall require or permit any driver used by it to drive, nor shall any such driver drive in interstate commerce until the driver has met the minimum hours off duty requirements of 49 CFR § 395.3 (property carriers), and§ 395.5 (passenger carriers). In accordance with 49 CFR § 390.25, this extension to the Emergency Declaration is effective immediately and shall remain in effect for the duration of the emergency (as defined in 49 CFR § 390.5) or until 11:59 P.M. (ET), February 11, 2018, whichever is less. On January 2, 2018, Orlinte Cruz, owner of Cruz and Sons Transportation, LLC, and UGMA Logistics, Inc., Dallas, Texas, pleaded guilty to honest services wire fraud in U.S. District Court, Dallas. The plea was the result of an information filed on November 16, 2017. The information alleged Cruz and two Texas Department of Public Safety (DPS) troopers concealed material information concerning Level 1 commercial motor vehicle inspections of Cruz’ trucks. DPS performs Level 1 inspections to ensure commercial vehicles are safe for highway travel. The DPS inspection reports are then electronically transmitted to the Federal Motor Carrier Safety Administration (FMCSA) database so the trucks can receive Commercial Vehicle Safety Alliance decals. According to the information, between July 2014 and September 2015, Cruz paid a DPS trooper $4,000 to receive favorable Level 1 safety inspections, and the trooper electronically submitted 39 false truck inspections reports to the FMCSA database. DOT-OIG conducted this investigation with assistance from the FBI, Texas DPS Texas Rangers Division, and the U.S. Attorney’s Office.